I know this is often a roots blog but IT'S MY BLOG and it's ALMOST MY BIRTHDAY so I can do whatever I want. When I came across The Greys I immediately purchased their album. It's that good. Also, while I can't possibly buy all the albums I feature on the blog (I mean...that's why I do the damn thing in the first place) and while musicians don't make any money, jazz musicians make even less so I wanted to support them. And, as a bass player myself, I couldn't resist falling in love with the voice-and-bass duo's inventive arrangements. 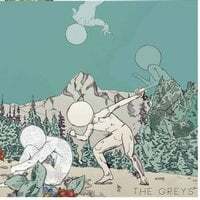 The Greys' brooding music focuses on heavy stuff -- namely, mental health or the lack thereof. What I like about the duo is that they're not writing party music nor are they noodling around for the sake of Art. The lyrics truly keep the duet grounded in purpose. The album has some beautiful performances on it and needs to be listened to all the way through. Bloggers make even less money than jazz musicians! Help support the blog by subscribing to my Patreon or dropping a tip in my Ko-Fi cup (no account required)!